During Prime Minister Narendra Modi’s first year in office, the health ministry has relaunched existing programmes and claimed credit for programmes not launched by the National Democratic Alliance (NDA) government. Claim: A new programme named Mission Indradhanush will target areas of low immunisation. Reality: Mission Indradhanush is the new name for Special Immunisation Weeks (SIWs), which have been conducted every year in areas of low immunisation under the Universal Immunisation Programme (UIP). Special vaccination campaigns have been planned for seven to 10 days in 201 high-focus districts during March-June 2015 under Mission Indradhanush. But this has routinely been done in preceding years. For example, in 2013-14, four rounds (April, June, July and August) of SIWs were conducted in 31 states and union territories. More than 9.8 million doses of various antigens were administered to children. Similarly, during 2012-13, SIWs were carried out in low-coverage areas and more than 17.3 million doses of various antigens were administered. Claim: Mission Indradhanush, “the largest-ever immunisation drive”, will immunise 8.9 million children. Reality: UIP is one of the largest programs in the world, according to immunisation summary report jointly published by United Nations Children’s Fund and World Health Organisation. More than 20 million pregnant women and children were immunised during 2011-12, according to data released by the health ministry. Claim: INAP aims to end all preventable new-born deaths and still births by 2030. Reality: INAP is the latest entrant to a long list of existing interventions under the National Health Mission (NHM) to reduce neo-natal and maternal mortality. The two targets proposed in INAP are (a) reducing preventable new-born deaths and; (b) reducing preventable still-births to single digits, fewer than 10 per 1,000 live births by 2030 (as against 22 per 1,000 live births today). Claim: Launched the country’s first-ever mental health policy. You can read the introductory piece of this series here and the first part here. 1. 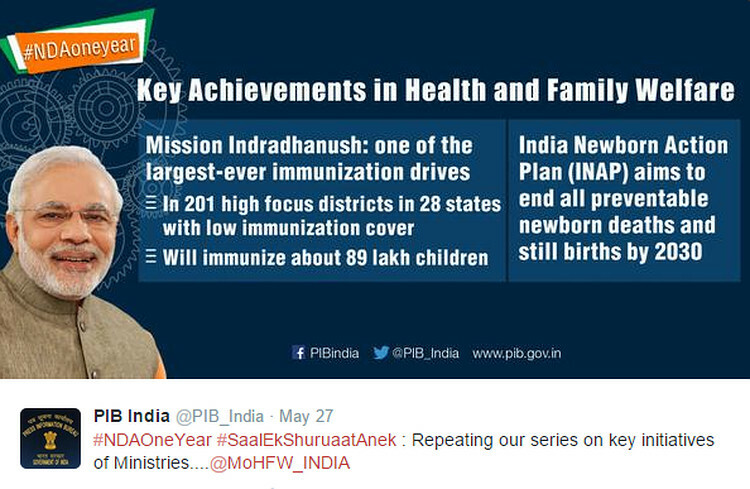 Mission Indradhanush: Author should have mentioned the aim to increase coverage from 65% in 2014 to 90% in 2019. Is this not a step in the positive direction? Also, for comparison, what was the improvement in coverage over the last 5, 10 years? 2. Mission Indradhanush will be world’s largest immunisation drive: It already is: 8.9 million children would be 1/3 of the numbers of 2011-12. So it is actually a drop. Why is there no mention of that in the text? Not to mention the Mental health policy was ideally targeted at CONgrASS members. You need help, or a deportation. Ignorance and showmanship are not valid arguments, even if that is what our PM relies on. Tum na mujhe deport nahi kar sakte.. itna tumhari haisiyat nahi hai. Help kar sakte ho..go and drown collectively in the Arabian sea (or indian ocean choice is yours) and never come back. Kyaa? BTW that comment of yours proves my point that you are mental. That double negative at the start is enough to indicate you have little or no intellectual substance. In other words, you are not to blame for your ignorance. It most likely stems from a household of primitive thinking, sadly the apples don’t fall far from the tree. Know this tho, my moronic friend and countryman. You are not doing any good for yourself, your family or your country. “Mental” doesn’t suggest I’m in anyway lacking in mental faculties either. So your comment basically said nothing. Do you realize none of your points make sense? “aim to increase….2019” this isn’t a review of Govt policies and intentions. It is a fact check of Govt claims, and shows where the Govt. has lied/misrepresented facts to mislead the people. A free and unbiased media is a pillar of democracy, and such checks should be done in main stream media, who have the resources to make a difference. If you want a better India, why hide from the facts?